This AMT/Ertl model is over 22 inches long and is in scale with the AMT/Ertl Reliant. This was the model released during the Star Trek movies 1-6 (with the exception of the "smoothie" Enterprise). 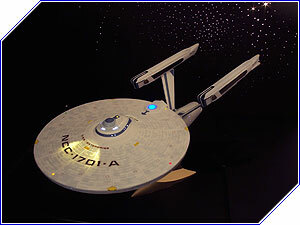 This model, as either the refit 1701 or 1701-A, can be built, painted and/or fully lit to look exactly as it did in any of the Star Trek movies. It will be painted with the full Aztec paneling in authentic pearlecent paint coats along with accurate color schemes. Approximately 70% of the windows are drilled out and will be lit along with blinking formation lights, navigation lights, and unique spotlights, if desired by the customer. NOTE: Since this model and the Reliant are of the same scale, we also offer both models together in a battle scene diorama from 'Star Trek II: The Wrath of Khan'. Please call to discuss this option.